Want to learn how to successfully design, build and test apps for the Apple iPhone and iPad? 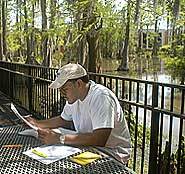 UL Lafayette’s Continuing Education has just the class. iPhone Application Development will introduce students to Objective-C, the Apple Software Development kit, frameworks and the Apple integrated development environment required for app development. Class participants should be familiar with basic data structures, logic flow control, looping, program structure and procedural or object-oriented program design. This course is one of 20 new Continuing Education courses being offered this fall. Others include Aikido and self defense, Art for the Absolute Beginner, Darwin for Dummies, Google AdWords for Businesses, Social Media that Sells, Real Estate 101 and Web Design with xhtml, html and CSS.